Beginning/intermediate level. The culmination of Jamey's 25 years as one of the world's leading jazz exponents. Volume 1 has unlocked the mysteries of jazz improvisation for a whole generation of musicians who previously had nowhere to turn for competent rhythm sections and accurate instruction. Now, Volume 1 has all new, updated information presented in a new manner that is both easy to understand and inspiring for all musicians wishing to explore the secrets of jazz improvisation. 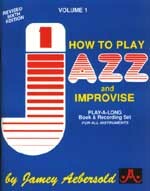 Includes chapters on scales/chords, developing creativity, improv fundamentals, 12 Blues Scales, Bebop scales, pentatonic scales and usage, time and feeling, melodic development, II/V7s, related scales and modes, practical exercises/patterns and licks, Dominant 7th tree of scale choices, nomenclature, chromaticism, scale syllabus, and more. Includes 2 play-along CDs.